I’m a huge fan of accountability. And for writers, especially writers who struggle to begin their book or those who peter out before they finish what they started, a little accountability goes a long way. Accountability is about being responsible, to yourself, to your project, and possibly to other people. When a writer makes the choice to be accountable to someone or something to keep them moving forward, they are essentially saying a big “hell yes” to their book. 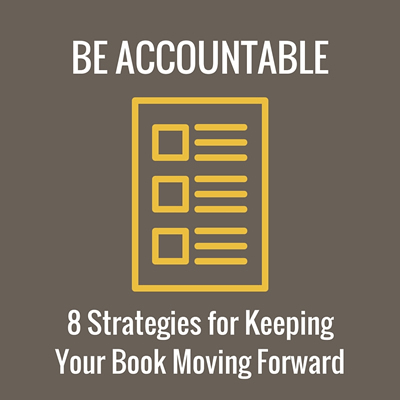 I build accountability into the process of every book I write in a variety of ways. Here are some of my best accountability strategies for writing a nonfiction book, along with a few other ideas. What might work for you? 1. SET A REAL DEADLINE: Napoleon Hill said that “A goal is a dream with a deadline.” So turn your dream of writing a book into an actual goal by setting a concrete date for finishing your proposal or manuscript. To take this a step further, break down the big goal into mini-goals to make sure you stay on track, marking all these dates on your calendars and setting associated alarms. 2. MAKE WRITING DATES: Weekly (or more frequent) work dates with a friend are an easy way to make writing a more enjoyable proposition. Your work partner doesn’t have to be writing a book … he or she can be doing their own thing. The important thing is a shared understanding that you’ll both use the time together to focus on your stated project … in your case, your book. 3. DECLARE YOUR INTENTIONS ON SOCIAL MEDIA: Take to Facebook, Twitter, or your blog to publicly put your stake in the ground. You’ll gain the supportive energy of your online community while simultaneously benefiting from the side-effects of gentle social media peer pressure. 4. GET INVOLVED WITH A WRITING GROUP: Find a critique group, a local writing club, or create your own writing community comprised of a few supportive friends and keep each other honest and moving forward through regular check-ins (and gentle nudging when necessary). 5. TELL EVERYONE WHAT YOU’RE DOING: This one might be difficult for many writers, but if you’re willing to put yourself out there, it can be an effective accountability strategy. Because when you enthusiastically let everyone you know you’re writing a book, chances are they’ll be inclined to ask, “How’s your book going?” anytime they run into you. Wouldn’t it feel great to be able to tell them you’re nearly finished? 6. BE PART OF A MOVEMENT: Keep your eye out for organized writing efforts or movements that you can tag along with to help you reach your goal. For example, NaNoWriMo rallies more than 300,000 writers around the world each year to commit to writing a 50,000-word novel. The community support is one of the reasons it’s so successful. 7. ASK A FRIEND TO CHECK IN WITH YOU: Let your best friend or sibling or partner or other ally know what you’re trying to accomplish and give them specific instructions on how and when to check-in with you. Ask them to mark dates on their calendars for sending you a quick text or email asking you point blank: Are you on target for reaching your writing goal? or Did you write your 1,000 words today? 8. REVIEW YOUR WRITING GOAL(S) WEEKLY: Writing out goals, setting deadlines, and coming up with an accountability plan only works if you regularly assess your progress as you move toward it. Set a regular time for reviewing where you are and make adjustments as necessary to stay on track. I can’t stress this enough: If you have a goal of completing a book proposal or a book, do not skip this step. Take a few minutes to map out your own accountability plan (download an interactive Accountability Plan Worksheet here). And then stick to it. And if you want to apply a little gentle peer pressure, publicly declare your goal on Facebook, Twitter, or Instagram, and tag me so I can cheer you on.